For the last three years I’ve been trying to grow tarragon on my roof terrace. The first year, my seedlings dried out and died. The second year the snails got them! This year, I managed to grow a nice tarragon plant from seed…only to discover I’d got it wrong. The sort of tarragon you grow from seed is normally ‘Russian’. It’s not the real McCoy. While both French and Russian tarragon is used in cooking, Russian tarragon tends to have a bitter undertone in its flavouring, as opposed to the smooth and slightly sweeter taste of the French variety. Apparently, you can tell by the shape of the leaves (I can’t!) or by the taste (that DOES work for me). To grow French tarragon, you need to split an existing plant, or take a cutting and root it. Or, do as I did and go to your local farmer’s market on Herb day and BUY one! I am very happy to have paid my £1.50 for the pretty tarragon plant on the roof terrace. I just hope I can keep it alive now. Anyway, now I have the real thing growing I’m rather enjoying using it. 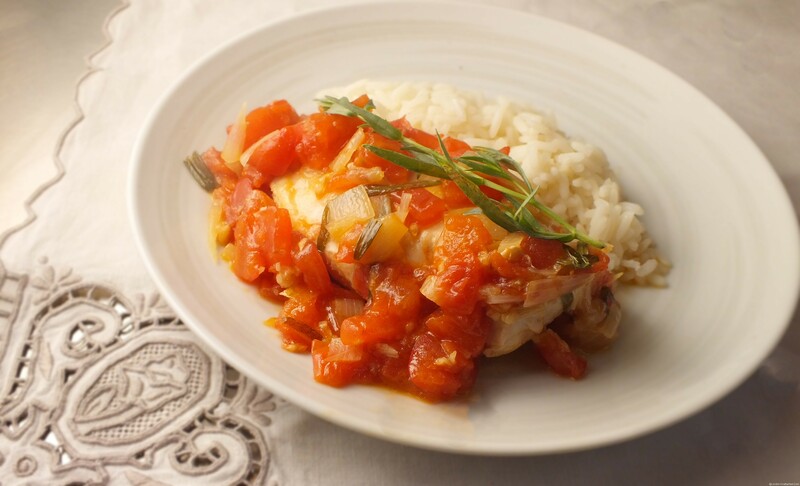 I’ve always made tarragon chicken with a cream based sauce but, I had a few tomatoes that needed using up tonight and I’ve been served tarragon chicken with tomato when I spent my holidays in France. Here’s my very simple tomato and tarragon chicken recipe. If you want to make the cream based version, simply substitute a couple of tablespoons of double cream or creme fraiche for the tomatoes. But, this is healthier – and very, very good! I believe this is a classic French dish. It works best with skin on, bone-in joints of chicken, but for a quick supper or to cheer up otherwise boring chicken breasts, this is an easy win. Heat the oil in a skillet and gently fry the shallot and garlic for a couple of minutes. A DELICIOUS recipe Fiona and with one of my favourite herbs…..I have a chicken and tarragon recipe, but curiously enough it is VERY different to this….I say curiously enough, as you would think that chicken with tarragon would be a fairly similar recipe! Anyway, I digress, thanks VERY much for adding this recipe to the Herbs on Saturday recipe linky, and I agree, French tarragon is MUCH better than it’s Russian cousin! Haven’t tried tarragon before (I think – at least not used it myself), but I don’t see any room yet where to put it. Looks good and for sure is very delicious! if you have had bernaise sauce it is usually made with tarragon, so maybe you’ve tried it in that? I absolutely love tarragon! I have two of the French tarragon plants growing in pots on my deck. My favorite use is with eggs (omelette) but I am always looking for more tarragon recipes. Thanks for sharing this and I will have to try it soon. tarragon chicken with a cream and tarragon sauce has always been a staple for me, this version was a little healthier! I was so cross though when I found there were two sorts and I’d grown the wrong kind!! !